Shunhyashunya Pvt. Ltd. is a small company based in Estonia and founded in early 2013. Our goal is to provide yogis with a fun, inexpensive and individualized experience, enabling them to discover and master yoga practices more efficiently. Shunya or Shunyata is a concept found in Buddhist, as well as Vedic teachings. Translated from Sanskrit, these words mean "zero", "void", "vacuity", "openness", "emptiness", "spaciousness", yet have a deep philosophical meaning. In Indian thought, the number zero is believed to be the most significant number of them all, as it reflects reinvention and energetic flow. From Buddhism, we know this concept to describe the true nature of all, where dualities do not exist. It stands for the only existing constant, which is disguised by the never-ending change of phenomena, appearances, identities and substances. This concept also refers to a meditative state of emptiness, where the empty mind can see the true nature of reality. This state has no limitations, no borders and, thus, has infinite potential. "Shunya is like the sky - pure presence. You cannot touch it, although You live in it. You cannot see it, although You can never be without it. You exist in it; just as the fish exists in the ocean, You exist in space, in shunya. Shunyavada means that everything arises out of no-thing." I took my first yoga lesson at the age of twelve and somehow I knew I was engaging in something special. When I was fifteen years of age, I began to take interest in Eastern philosophies. My attention was captured by Buddhist texts, as I found the kind of wisdom there that seemed to fit with the way I believed our existence should be interpreted and understood. At sixteen, some yoga books had found me and I took up asana, pranayama and meditation practice independently. Even though I practiced erratically, the seed of yoga had been planted. I evolved along with my practice, until yoga had become a normal part of my daily experience and I found myself on the mat and in life every day. Having practiced for eight years, I started teaching a few years ago in India and Denmark. I teach mainly on an individual basis, as it is important to me that the student gets focused attention. Bodies, emotional landscapes and beliefs are different from person to person, so I´m a strong advocate of yoga as an intimate relationship the practitioner develops with himself or herself. As a teacher, my purpose is to understand the student and facilitate his or her practice to the best of my ability. A lot of my teaching comes from Buddhist thought and svadhyaya or self-study. I associate yoga with freedom and self-sufficiency. It gives strength and enables us to become truly free and in control of our lives. Yoga is what happens when we align our thoughts and actions with our true self. At Shunyashunya, I spend most of my time handling many of the ´behind-the-scenes´ tasks, including video recording/processing and website hosting/maintenance. As You might have already guessed, my educational background is IT-based. Most recently, I graduated in early 2014 as Web developer from UCN, Denmark. I moved to Estonia in 2014 where I took on the challenge of creating a yoga video portal that was to become Shunyashunya Yoga Shala. From under the roof of Shunyashunya, I also take on the role as an IT-consultant and Systems developer for some of our other partners. A few years back, I would have most probably laughed at the idea of being titled as a ´founder of a company´, since I´ve never thought of myself as a person, who gets excited about business. As a matter of fact, I still don´t, to a great extent. But what I have found is that there are millions of ways to do things and, in the end of the day, what matters is just that - HOW we do things. I believe that doing business can be a noble path, as long as we approach it with integrity, love and intellect. This, in short, is the good spirit, in which entrepreneurship should be practiced. We should all strive to cultivate a sense of community in our workplaces and remember that all good things start with each end every person´s thoughts and small actions. I believe that yoga is everywhere around us, perhaps most explicitly through its teachings of moral and ethical conduct, so I strive to realize the yoga in all my business affairs, too. I really take it to be normal that business should go hand in hand with good manners, good intentions and compassion. Music Therapy Center is a place, where alternative health and wellness methods come together. The center offers yoga group classes and privates in collaboration with Shunyashunya Yoga Shala. Our collaboration partner GAME club organizes innovative trainings based on the game method. Primarily working with kids, they conduct games that emphasize life competencies and social skills. 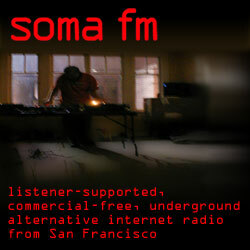 SomaFM delivers the radiostations that we make available to our users while they watch our videos.